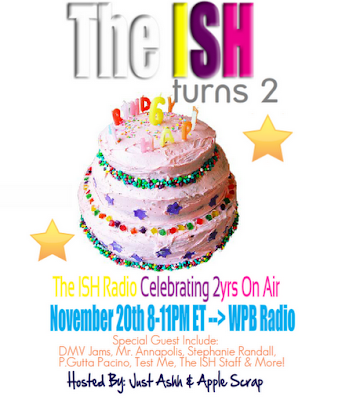 On Sunday, November 20th The ISH celebrated 2 years on air with The ISH Radio. The ISH is lifestyle brand that represents Inspiring Social Hotness. The ISH Radio debuted in 2009 on Blog Talk Radio and has managed to connect with over 15,000 listeners. Also interviewing guests such as Nicki Minaj, Fat Joe, T.A All Day, Bossman, Mullyman, Fat Trel, Mr. Annapolis and many more. The ISH Radio made it's transition to WPB Radio in October of this year, with the support of Frank & April Johnson of TaskForce Marketing. The studio was packed and the bottles were flowing.. we had past co-host of the ISH Radio Stephanie Randall, & P.Gutta Pacino and of course our current co-host rising Baltimore comedian Apple Scrap. The party didn't stop there as the phones calls begin flood in and Mr. Annapolis, The ISH staff and DMV Jams came through giving out swag and showing us so much love. We had an amazing time and would like to thank all of our listeners, followers and supporters! In 2012 you can look out for several big projects in addition to our monthly FREE happy hour events launching in March 2012 via (Party With The ISH), our 2012 Birthday Bash event in February and new episodes of 'Social Hotness With Just Ashh' on Stitcher Radio coming in January.